The store in its approximate location at Burnett's. 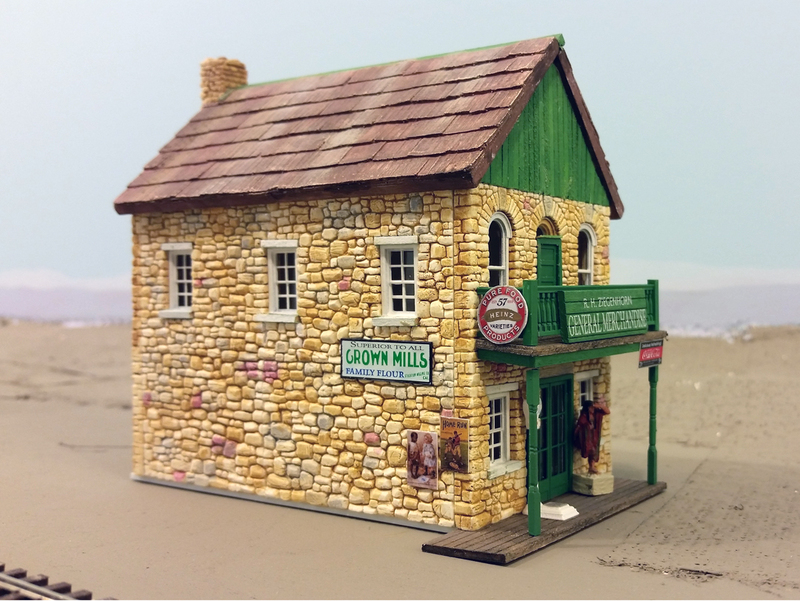 The Crown Mills sign was taken from the side of another store in Fillmore, California. The last few days I've been working on a C. C. Crow kit which I had picked up many years ago at a swap meet. It appealed to me because I distinctly remember the prototype which inspired the kit. 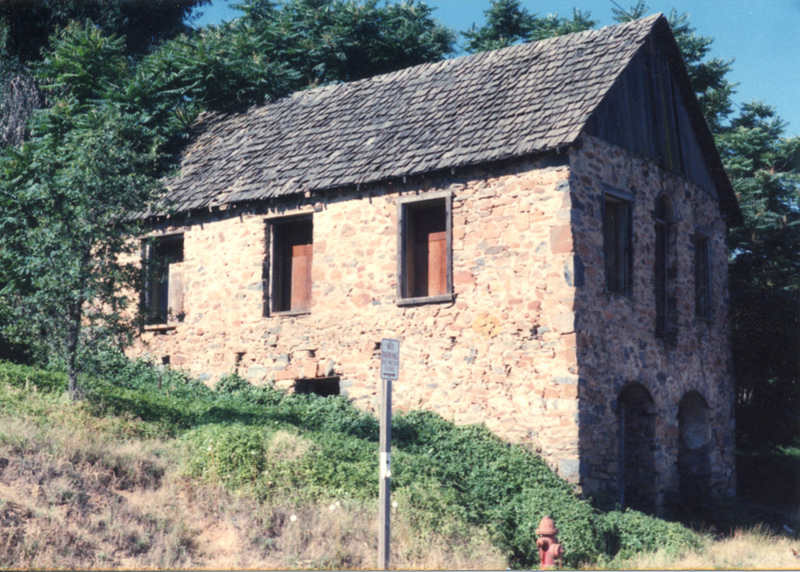 It was an 1850s building located in Shingle Springs, California. I had been by it many times and had photographed in the 1980s. The Crow kit is not an exact replica as he admits patterning the kit by memory but it's pretty close. 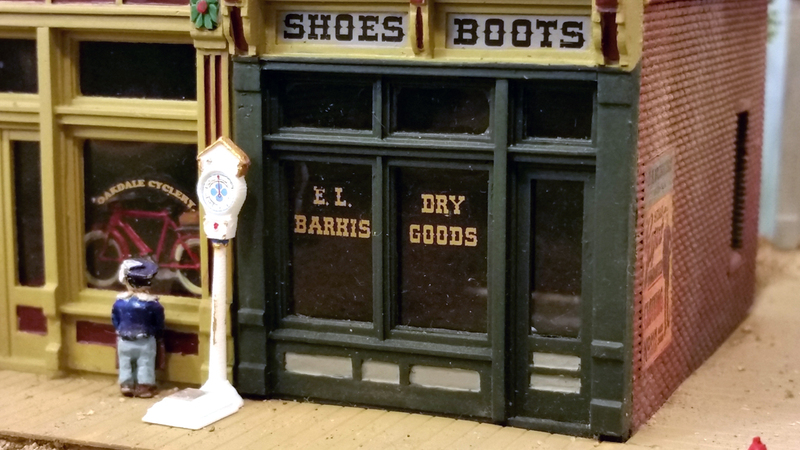 I had no names of actual businesses in Burnett's so I named the store after a friend of mine who is an excellent modeler. It is a plaster kit which is easy to work with but there is a chance of the seams showing in the stone work. I used heavily thinned colors to stain the walls after sealing them with clear spray. After the assembly, I added some signs and posters to advertise some of products sold by this small country store. The posters were found on the internet and just printed on photo paper which gives a slight glossy finish which hopefully looks like porcelain. The cigar store Indian in the photo was from a now-forgotten line of figures while the scale is the one discussed in my last post (http://sandcrr.blogspot.com/2015/04/a-weighty-matter.html). Since then I found that the kit was missing the legend above the dial advertising your "Exact Weight - One Cent." I added that and sent a photo to the manufacturer who agreed to add the decal to his kit. The Shingle Springs building in the 1980s. The shop doors and second story door was also an addition made by cutting down some Grandt Line doors. The only disappointment was when I learned that the prototype had been torn down a few years ago. It's interesting that there is always enough money to bulldoze a building and cart off the stone but never enough money to repair it. Residents of Oakdale can now get weighed on East Railroad Avenue with the new penny scale outside the dry goods store and the cyclery. A couple of weeks ago, I had a visit from Mat Thompson of Virginia, also a modeler. We got to talking and he mentioned a model company of which I had never heard. It was Mok River Models (http://mokrivermodels.com/mokrivermodels.com/Home_Page.html) in Woodbridge, California. 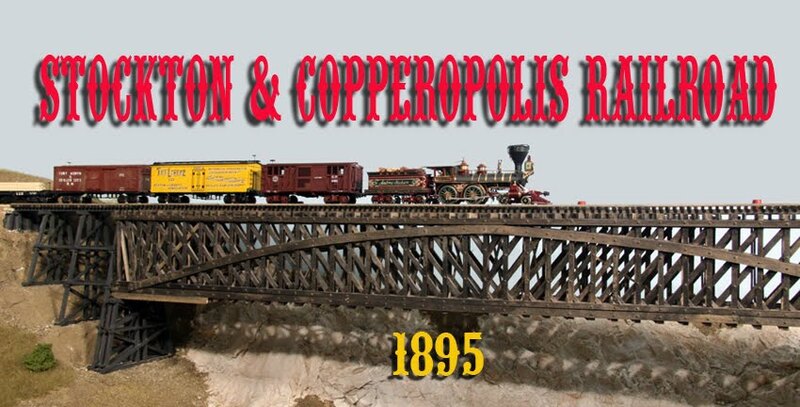 I looked at their webpage and they have several items of interest to period modelers. I loved the 1913 Stanley Mountain Wagon but it's way too late for the S&C. I ended up buying the Penny Scale kit. It is not a lot to the kit. The scale body is made in one piece by 3D printing but you do have to paint several places and apply the decal for the scale face. Sidewalk scales used to be more common than they are today and many times, I have paid my penny to see my weight and, maybe, get a fortune as well. A nice addition to a street scene. Thanks, Mat, for the tip. The S&C's new American at the head of Train No. 6 ready to depart from Oakdale. The passenger cars are brass imports by Beaver Creek. The local passenger trains are on the S&C are made up of brass imported cars which are very heavy. Although my smaller 4-4-0s can pull four of these cars, it's about all they can do. I wanted to come up with a slightly heavier, more modern engine which can pull a little more. 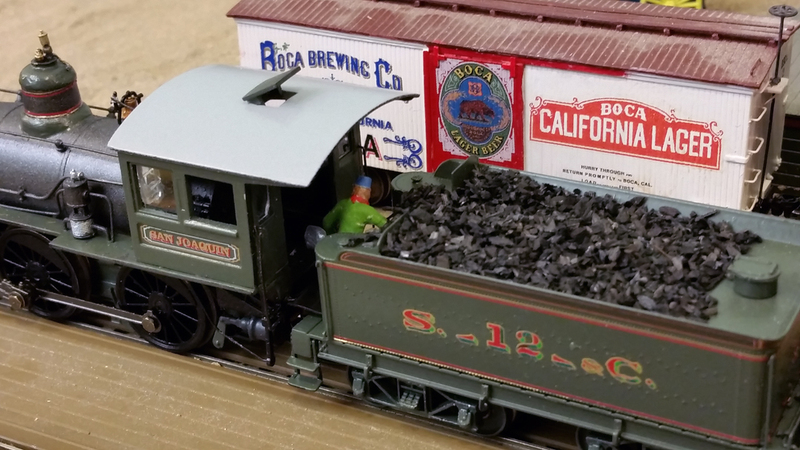 My choice was the Bachmann Spectrum Richmond 4-4-0. As manufactured, it represents a loco of about 1910 where I wanted one a little older. 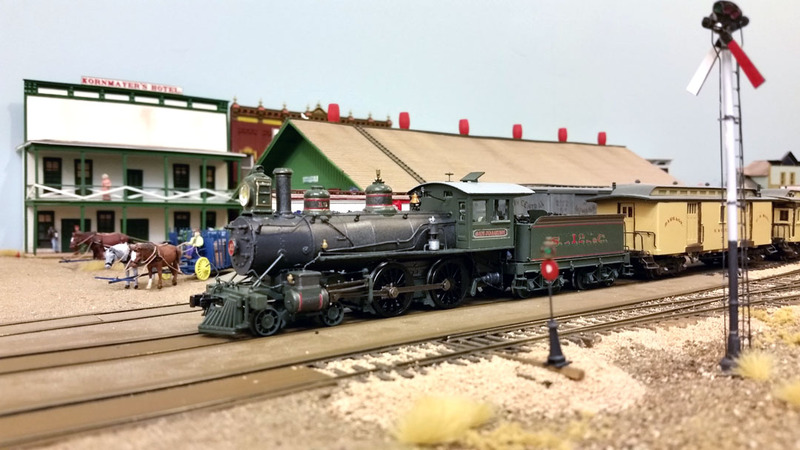 The tender is from the Bachmann Baldwin 4-4-0 which looks better for the time period of the railroad. I began my conversion by removing the stack, domes and generator. The domes were replaced with Precision Scale domes which are more of a Baldwin style. The stack was replaced with a capped stack just because I like capped stacks. All of my locos use oil headlamps so this was replaced and, of course, the dynamo was no longer needed. I swapped the original tender out with the tender from the Spectrum Baldwin 4-4-0 and removed the DCC decoder with which it was equipped. This was replaced with a Tsunami TSU-750 and a sugar cube speaker. 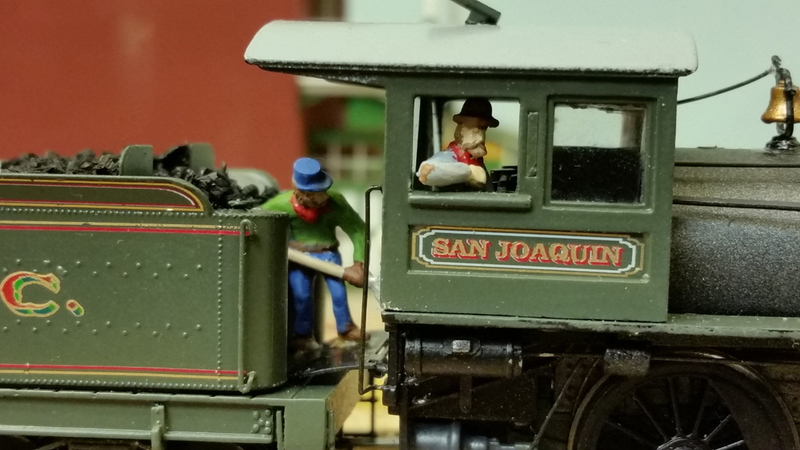 The engine was then painted and lettered to suit the railroad's management receiving the name San Joaquin in the process. San Joaquin is the California county in which most of the railroad runs. The engineer, appropriately attired with a derby hat and 20-past-8 mustache appears competent enough with a husky fireman keeping up the steam. The engine crew is from Musket Miniatures. Overall, the conversion was not too bad. The loco comes apart easily and is readily modified as long as one is willing to do a bit of filing and drilling here and there.